I'm busy enough that I don't write much fanfic anymore, but this summer I made a secret pact with Ryan Boyd. Pursuant to our pact, I wrote a story idea that I've been thinking about for years. It's a crossover between two Horror icons that requires you be fairly weird to enjoy it. Friends, I love being fairly weird. She was like the revenge of all the snarls of hair stuck in all the drains in all the world. There was more hair than skin, swirling out at all angles as she darted through the chlorine-reeking pool. Unlike the other students, she went lap after lap without ever coming up for air. Jason never saw her face. Jason knew better than to turn around, and he still did it. It was a reflex. There was nobody there – not corporeally. How he hated ghost bullies. A red balloon floated in front of Jason’s eyes. That one was Paimon. Pennywise and Paimon, the new popular kids in school. The popular kids always hunted in packs. You never knew when the next attack was coming. They were both invisible, save for the balloon that drifted closer to Jason. Jason held up his hands, and tried to swat the red balloon away. It burst, the sound echoing throughout the swimming pool, and he lost his balance for a moment. Someone shoved him hard and he stumbled toward the pool, careful to keep from falling in. Jason barely braced before the next shove came in a gust of fetid air. It was harder than any shotgun blast he’d ever felt, and sent him sprawling through the air. The humid warmth of the pool sprang up even before he hit it. Then he was underwater, that chlorine sting in his eyes, and up his nose, and filling his lungs. The water always got in Jason’s lungs. This was drowning, and he thrashed, and in his idiot reflexes, tried to stab the pool. Pools didn’t bleed, and waving his arms, he barely got his nose above water, the stuff streaming through every hole in his mask. His eyes were muddied, and he couldn’t even see the invisible figures that blinded him. Their voices always sounded the same, harmonizing into laughter. He reached for them, and all he got was a handful of balloons. They didn’t float down here. The world filled up with the sounds of bursting balloons, and Jason thought he went under again, but he was lifted up. Something caught his hand, like a thousand steely strings wrapping around his fingers. He sprawled forward onto the edge of the pool, groping for whoever had caught him, ready to ring Pennywise’s neck if this was another game. There were no clowns, and no invisible ghosts laughing. There was only the sloshing of the water, and something dripping to his left. Hair was tangled around his hand, and it writhed free, going back to its owner. It had pulled him out of the drowning. The figure of hair that had been swimming laps paused at the edge of the pool, and inside it, eyes darker than coal bored into him. It was like a power drill to the mind. It stung and was nice at the same time. He was used to staring. He stared back. It was all he knew how to do to thank her. The girl and all her hair dove back into the deep end without a word. That was for the best. Jason had never been good at banter. Third period was Mrs. Bates’s class. Jason sat in the rear, alone at his table, because no one ever partnered up with him. All the ghosts and witches thought he was a teacher’s pet for being so enthusiastic about Stabbing Class. But today there was a new girl. She wore a white dress that kept dripping everywhere and never seemed to get dry, and she was buried under a veil of gnarled black hair. Sadako gave a dead stare with her coal-black eyes. Sadako sat at the next table over from Jason, becoming another kid sitting by themselves at Vincent Price High. It was only the weirdos who sat with someone here. Every seat had a dead frog on a tray set up in front of it. Jason loved frog dissection days. He brought his own machete. It was one of his few guaranteed A+ assignments. Over at her table, Sadako tilted her head over her frog. Her arms remained at her sides, ignoring the school-issued knives on her table. It was like she didn’t even know how to pick it up. She’d probably developed her own style back in Japan. Maybe her way had to do with swimming. Mrs. Bates made a move like she’d come to the back of the room, and Jason tensed up, raising his machete on instinct. He overcompensated sometimes. Fortunately Chucky started freaking out in the front of the room just then, screaming a culturally appropriated oath to transfer his soul into his frog. He’d probably had sugar at lunch again. 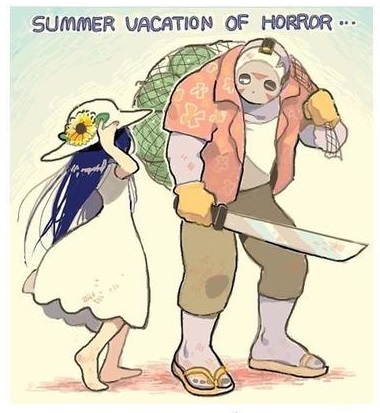 Sadako looked at her knife like it was utterly alien to her, as alien to her as swimming was to Jason. Jason glanced to the front of the room, where Mrs. Bates was still wrangling the disobedient doll. He had a moment of distraction here. He leaned to Sadako’s table and quickly took her knife, made the slit in the belly, and impaled the frog’s heart. It was hasty, but at least worth a B. Then he ducked back to his chair, and went to work on his own frog with the machete. The MO on the two frog stabbings was nothing alike; Mrs. Bates would never expect it. Sadako stared at him. Briefly he wondered if she’d practice stabbing on him. For lunch he always went to the picnic table out behind the school. He’d get to the table before any of the other stampeding students even though he only walked. It was his talent. Maybe someday he’d adapt it to Track and Field. Most students preferred to stick to the cafeteria where there was ample school staff to stalk. Jason didn’t stalk lunch ladies. Their lives were already harder than a Slasher movie. Today someone else was already sitting on the picnic table. She sat on the table top and her feet resting on the bench, facing outward. Sadako was staring at him before he even knew she was there. He paused in front of the table, uncertain of what to do. He wasn’t good at banter. She scooted to the left. He sat down and ate his gory sloppy joes. He left half of one for her. She ate it without thanking him. She never said a word about the weather, or the new stuff on Netflix, or saving him from spectral bullies at the swimming pool. They sat in a horrendous silence for the entire lunch period. It was the best. They sat together for every lunch every single day. On holidays, when nobody was camping too close to his lake and needed butchering, he still came to school to sit with her. She always beat him to the picnic table. A few times she tried to get him to swim. He toed at the water, but wouldn’t go in. She lured him by staying near the edge down in the water, and she never yanked him in. When the bullies tried to prank him, she always dispelled them with her nightmarish gaze. Even the creepy janitor stayed away from her. To help her practice for Mrs. Bates’s class, Jason gave her a machete of her own. It was his first one, from when he’d been smaller. He figured it would fit her hands. She didn’t wield it often, but she didn’t throw it away, so she probably liked it. Jason wanted to invite her to his place for a weekend sometime. They could eat lunch together on a Saturday for once. They could torment campers together. Maybe he could introduce her to his mom’s head. To his surprise, she invited him to her place first. It was a sunny Friday afternoon, on the 13th of June. The luckiest Friday. She gave him her house key. It was shaped like a VHS tape, but it was clearly a house key. They understood each other well enough to intuit those sorts of things. Non-verbal didn’t mean non-communicative. He took it home that night and pushed it into his battered old VHS player, a relic of the bygone era he’d never grown out of. Despite having no power in the shack, the TV flickered to life. He never forgot what he saw. The moonlight disappeared. A voice outside his window hissed that he had seven days. He wasn’t sure if this was what other kids called flirting. It wasn’t that hard to find Sadako’s home. The video was full of clues, and Jason had always found walking in the woods for days on end soothing. The hardest part was believing she actually lived there. Her home was a stone well, just like from the end of the video. There were rickety wooden boards nailed over the top of it, not so unlike the surface of their picnic table. They were nothing he couldn’t punch through, but that wouldn’t make a good impression, especially if she had family in there. He knocked on the lid of her haunted well. So he stood there and lurked. He was great at lurking. Lurking was an extracurricular that would help him get into college. After seven days, the boards creaked and slid south. Out popped Sadako’s mangy hair, whipping out like octopus tendrils. Her hair waved him inside. He expected an elevator to a Bat Cave with a 4K TV and some amazing PC gaming streaming rig. He expected an entire family of Sadakos, with monstrous haircuts and eyes that threatened to rip out your soul. He should have expected the water. There was water down in the well. It sloshed beneath Sadako’s ankles, soaking up into her dress. He sidled up close, then froze at the lip of the well. It smelled stagnant, and he could already taste it, and feel how it’d fill up his lungs. Sadako tilted her head at him, coal black eyes impatient. He knew he was making a bad impression. He was making her think he judged her home. He just lived in a murder shack in the middle of nowhere. She shouldn’t have to feel self-conscious about what was, probably, a perfectly sturdy well. He stuck one boot into the well, and the brackish water swallowed up his leg. He tried to pull himself up, to get a better angle and ease himself in, but scum on the bricks coated his hands and he slipped. The impact splashed everywhere, and he plummeted. He sank like his hopes of a happy tomorrow. It tasted like liquid dust, and it filled his eyes and his nose faster than hands could claw. He thrashed for a hold on anything. There was nothing down here to grab ahold of. No ladder, and no company, no family in the well. Sadako lived in the loneliness at the bottom of this place. Her hair wound around both of his hands and heaved him upward, forcing him over the lip and up into the air. He dug his fingers into the ground and trembled in a way that Pennywise and Paimon would’ve mocked for years to come if they had been invited here. Only he’d been invited here. He climbed back towards the well, trying to think of how to set Sadako at ease. Sadako dragged the boards over the well, covering it up. Jason didn’t even see her eyes before she locked herself into that loneliness. There was just a clump of wet hair between two bricks. Neither of them had phones, so he couldn’t exactly call her. He tried watching her VHS tape a few more times, tempting fate, begging to be cursed. If she wanted to materialize and kill him, she could. In anticipation of her arriving for revenge, he dressed up nicely. He put a fresh bag over his head – a whole grain rice bag that had never been worn before. If she was in the mood, he could take her to Make Out Point and dismember a nice couple together. But seven days later, nothing happened. He dreaded the idea that she was too heartbroken to hurt him. The seven days were unusually long for someone who prided himself on his lurking skills. He dwelled on the nothingness inside her well. She didn’t even have the severed head of a parental figure to look to for advice. He didn’t have to ask his mom’s head what to do. He knew. Sweltering summer heat threatened to rot what little was left of his flesh. He lathered on deodorant while watching Sadako’s video one more time. There was no darkness or whisper. He trudged through the woods, ignoring the sounds of campers necking and frolicking and disrespecting their elders. Behind him, Jason dragged the solution. The well was exactly where it had been last time. It wasn’t so eerie the second time you found it; sequels always lost something. He knocked quietly. The sound was so hollow; it was obvious only she was inside. Sadako didn’t answer. Jason waited a full seven days. His chest was tight with anxiety, but his lurking was on point. At the turn of the seventh day, the boards atop the well creaked. Just a little hair, and maybe the shimmer of a single coal black eye. He stooped and took hold of the solution. The chains rattled, and Sadako blinked at them. He tugged one end of the chains, showing they were tight around his right ankle. There was little slack in the chain between his foot and the cinder block. When he tossed the block inside the well, Sadako’s hair flew up to rescue him. He put up his hands, and held his breath, letting himself be dragged down into the murky water. He plunged down for the forever of an awful moment, then found soft grime at the very bottom of the well. Sinking his toes into the grime, he inhaled and let the water fill his lungs. He couldn’t breathe. He couldn’t see. This well was like drowning as an architectural statement. Sadako’s prodded him with her hands, and he jerked to one side, letting her join him at the bottom of her home. His hands balled into fists, and he let them. He let the panic into himself, just as she’d let him into her well. It wouldn’t be easy down here, but it was better that they did it together. Being alone would kill you. I am obviously weird. I did enjoy it. To the extent that I am now running late for my day because I HAD to finish it.